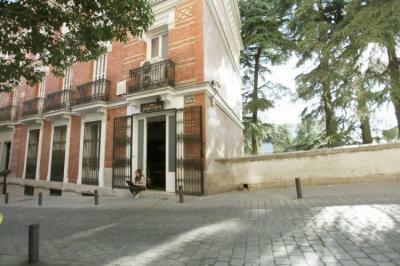 Madrid – Hostels in Madrid. Maps for Madrid, Photos and Reviews for each hostel in Madrid. 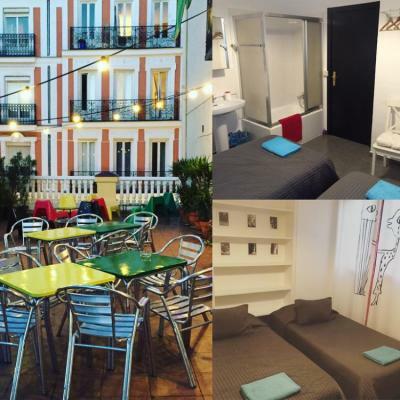 Looking for a hostel in Madrid? Look no further, all the good deals in Madrid are on Dorms.com. Like thousands of other people every month, book your hostel securely at the best price in all neighbourhoods of Madrid. 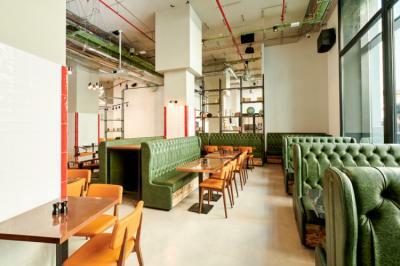 On this site, you can easily find a hostel downtown, in a trendy neighbourhood; a hostel in the student- university district, close to bus or train stations, airports or major attractions of Madrid. The rooms have a great privacy, being a hostel. The only discomfort is that we were on the first floor and all the noise of the street was heard. At 3 o'clock in the morning there was a lot of noise outside and it was hard for us to rest. We had a three-day stay in Madrid and this hostel has nothing to envy to a hotel. Young and super-friendly staff, modern room with 4 bunk beds and a private bathroom with simple but modern decor. The access to the room is done by QR code (electronic lock) 24 / 24h. The set is completely new and very clean. In the lobby a bar, a dining area and a mini stage with stands for mini shows (theater ...). Mix of concrete and metal, it's like being behind the scenes of a theater lit by floodlights. Only downside: the rooms are a little too heated at night. Attention, you must vacate the room at 11am. 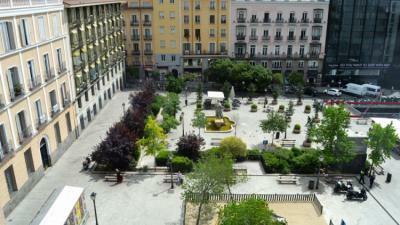 Exceptional value for money in the center of Madrid 50m from the metro "Tribunal". There are faults in the bathroom, balconies without shutters, they could put double glazing against noise at night. Missing hangers to hang clothes and bigger lockers. Four people do not handle themselves well in the room for four. There is no lift and upload luggage that is not a backpack, bicycle ...., up the stairs to the 2nd floor it costs work. 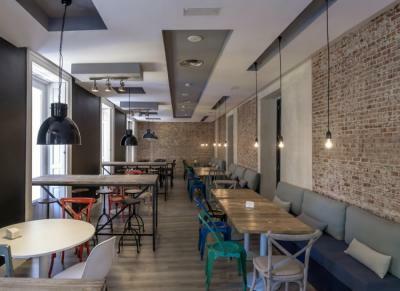 Safestay Madrid is located at 22 Calle Sagasta, in one of the best districts in Madrid, within easy walking distance of areas such as Castellana, Sol, Gran Vía, Chueca and Fuencarral. It is extremely well connected to public transport, two metro stations just a few meters away from the hostel, which connects to 5 different lines. The Alonso Martínez metro stop connects to lines 5, 10 and 4, while the nearby Bilbao stop connects to lines 1 and 4. The district has the best atmosphere in the city. It's a shabby, seedy, seedy place. The building was old and many things do not work well as my keys and doors. The people were very rude and in addition, the receptions did not offer much help. I stayed 5 days in this hostel. I missed a kitchen, a locker that closes, and the breakfast was of poor quality. I appreciated the kindness of the staff and the quality of the entertainment, the bathroom in the room. Attention air conditioning in the night can be very cool! I recommend this establishment for a few economic days! The hostel is very good, without problems and super central. A nice place, with attentive and friendly workers, clean, economical, downtown hostel with subway nearby. Very good hostel and very very good visit with Erika (wolves tour)! Easy transport access and super staff. The hostel is within walking distance of many places of cultural interest, like the Prado Museum or Buen Retiro Park, which are a 20 minute walk away. Across from to Almudena Cathedral and the Royal Palace. Because traveling on your own does not mean that you want to be on your own And when you travel with friends you don't want to waste a minute. Near la Puerta del Sol..near to everything. Very good, very good location and excellent treatment of workers. For a getaway to Madrid with perfect and economical teenagers. I had a shared bedroom that felt like a high standard hotel. The rooms are well decorated and the bathroom was clean and functioning. I had trouble getting wifi but I would recommend this place. We stayed two nights and it was fine. Everything pretty clean, although we asked to change the bed that had someone else's hairs twice and they did not change it. The common area is wide and the people very friendly. The hostel is perfectly located in the city center! Bus and taxi stops are right outside the door. The hostel is very clean, very pretty. Common areas are large and well appointed. The breakfast at will for 5 € is perfect. Clean hostel, however the rooms are very small .. service members will not always say hello, which I find more or less outrageous ... otherwise the linen provided very good quality and very comfortable beds .. the music in the bar down strong as in a techno bar .... it is difficult to communicate with the staff because, they are mostly busy playing video games .... so I recommend if you are very autonomous and intelligent because we will not explain much to you .. 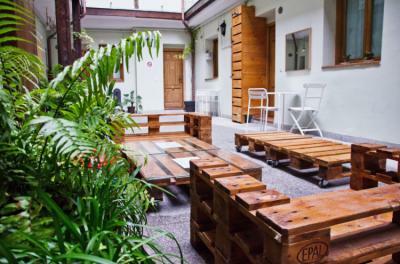 Cozy hostel, good location for sightseeing, spacious and equipped dining area. Top and easy access for a quick stay!